An all-around heavy duty folder from Extrema Ratio. A multipurpose "workhorse". This folder was developed to either be a substitute for fixed blades or to complement fixed blades. Only the hardest, thickest materials are used. 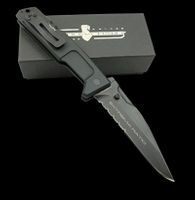 It has all the characteristics of the Fulcrum II Folder but has a heavier blade. Has a safe (and well tested) locking system. For a higher level of safety, it has a manual safety lock that you should engage. Be advised that the heavy-duty lock on the MPC requires substantial pressure to release it. The generous handle is made of anodized anticorodal, a type of aluminum that is very strong and corrosion resistant. You can use the end of the handle to break glass. It also has a handy lanyard hole.